After a career as an Episcopal minister, Paul Dawson turned to writing poetry in his retirement. He will give a reading at Grace Church on Oct. 21 at 11 a.m.
Paul Dawson is looking at death, again. He is 88 years old and one could say that death knocks a bit louder at that advanced age. Most would be inclined to add another lock to the door, pull the shades over the window and retreat to some safe distance inside. But not Mr. Dawson. After all, he’s been sitting at death’s bedside for nearly his whole career. And now in his retirement it is death that most often adds fuel to his poetry. 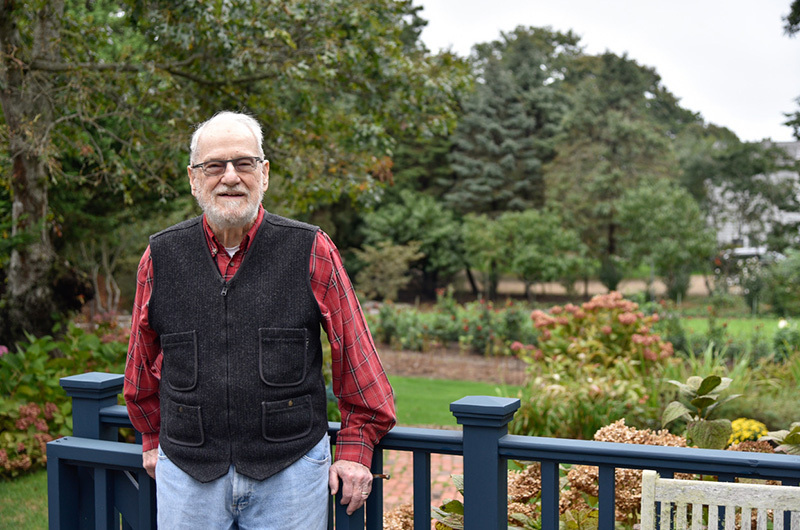 A retired Episcopal minister, Mr. Dawson divided his professional life between parish ministry and hospice chaplaincy, encountering people at their most vulnerable. “It was a fascinating experience, one of the most meaningful in my career, because your contacts with people are necessarily intimate,” he said in a recent interview in the Edgartown home he shares with his daughter Susan Dawson, daughter in law Alison Shaw, and grandchildren. “I learned a lot about human nature, about relating to people at that deep spiritual level,” he continued. Mr. Dawson’s bedroom is his oasis, filled with art, much of which he created, books, a stereo with large headphones and a modern turntable. “I’m a Bach fiend,” he says, nodding to his record collection. His room is also where he creates his poetry, an avocation that seized him during his retirement, much to his surprise. In college he was a music major and he thought after ministry he would pursue it again along with his painting. Instead, words called to him. “When my wife’s health began to fail I wrote poetry during that period, and as her health decreased I found myself writing more and more,” he said. That sort of mindset results in poems filled with meaning but also a light and hopeful touch. They are direct in their details but also lift off to the universal. Consider the title of his first collection of poetry: Musings of an Old Man, where a hint of irreverence already sets the stage. Then dig further, opening the book at random, perhaps to a poem called Presentation that begins: I wear the / encrustations of age / like a lichen-covered rock / at the seashore. In Mr. Dawson’s room the conversation continues, from taking care of his wife, to his career which amounts to the family business — his father, brother, uncle and cousin were all Methodist ministers — to auditing courses in Byzantine art, and back to his book of poetry. “It is a statement of my life experience so far,” he said. Perhaps nowhere is this more directly stated than in the final stanza of his poem Elders: Age is the safeguard of the precious / appreciation of the venerable / keeper of the holy. Musings of an Old Man is a holy work, guided by a narrator who does not look away from life’s hardships, and instead embraces them head on, with a curiosity and compassion all his own. Musings of an Old Man was designed by Susan Dawson with photographs by Alison Shaw. Mr. Dawson will give a reading from his book on Sunday, Oct. 21 beginning at 11 a.m. at Grace Church in Vineyard Haven. This will be an excellent reading but I'm unable to attend. How can I obtain a copy of "Musings of an Old Man"?